Billy Dee Williams is coming back in the Star Wars universe! 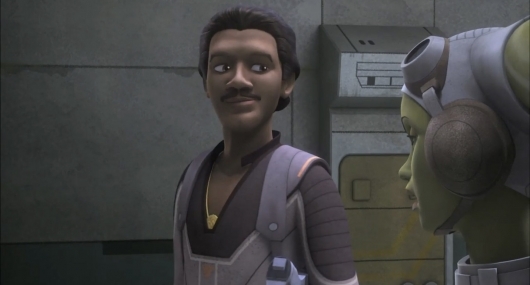 The actor will reprise his role as Lando Calrissian in the latest episode of Disney XD’s animated series Star Wars Rebels. 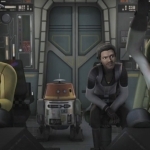 In the episode “Idiot’s Array,” Zeb loses the droid Chopper to a younger-looking Lando (Star Wars Rebels is a prequel) in a card game, so the crew of the Ghost make a dangerous run for the space pirate in exchange for getting the droid back. Check out some images from the episode here below. Also, EW has exclusive preview from the episode that includes some behind-the-scenes footage of the suave actor regarding his dialogue. Post by Star Wars Rebels. The wrong gamble with a new acquaintance forces the crew into transporting some unusual cargo. “Idiot’s Array” airs on Disney XD cable channel on Monday, January 19, but if you have the compatible cable services, you can watch it now online at DisneyXD.com. 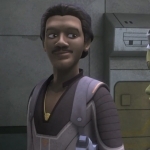 Williams, who played Lando on the big screen in The Empire Strikes Back (1980) and Return Of The Jedi (1983), has more than a cameo role in “Idiot’s Array,” unlike the appearance of the other four major original trilogy characters we’ve been on Rebels — C-3PO (voiced by original actor Anthony Daniels), R2-D2, Yoda (voiced by original voice actor Frank Oz), and Darth Vader (voiced by original voice actor James Earl Jones). 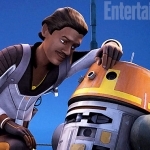 The 77-year-old Williams, who participated last year in TV’s Dancing with the Stars, recently brought Lando back to the big screen when he voiced the LEGO version of the character in 2014’s The LEGO Movie.